Reader Rachael Horcher found a way to get more bang for her buck when she donated to the Carry On Campaign - by using that weasel word "trilogy", she got three movie reviews for the price of one! Here is the story, the way I heard it: Steven Spielberg, having proven himself one of the most financially successful directors in history with undue speed, decided to get himself a protégé, and found one in the form of Robert Zemeckis, who had wowed the student film community at USC with his 1973 senior project A Field of Honor (which is, incidentally, a terrific satiric short, if you can scrounge it up). Spielberg saw something pretty darn special in the man five years his junior, and in 1978, he executive produced Zemeckis's feature debut, a Beatlemania comedy called I Wanna Hold Your Hand. It bombed. Undaunted, Spielberg threw his weight behind Zemeckis again two years later, with the dark comedy Used Cars. It bombed too. At this point, Zemeckis and his writing partner Bob Gale had a time-travel comedy about a teen boy who went back thirty years to become mixed-up with his parents, teenagers themselves. Supposedly, Spielberg liked what he saw, but Zemeckis was petrified that if he made one more Spielberg-produced flop, then his career would be over; he'd be "Steven's pet" for the rest of his life. He hooked up with Michael Douglas - a somewhat noteworthy producer in those days - to direct a project the latter man had been shopping around, a romantic comedy-adventure titled Romancing the Stone. When that film turned out to be a smash hit, against all expectations, Zemeckis returned to Spielberg, and together they made an even bigger hit out of that time-travel movie; the highest-grossing film of 1985, in fact. I am speaking, of course, about Back to the Future. If you are of a certain age, you've probably been recalling quotes from the movie ever since you saw the poster at the top of the review. It's that kind of thing: custom has made it one of the very icons of 1980s pop culture, less a film than a rite of passage. Which makes it kind of daunting for me (five years old when I first saw it on video, or was it six? - either way, I am suddenly made to feel ghastly old) to try and get around it in any kind of responsible, scholarly way. This was the "full disclosure" part of the review, if you were wondering. But there is more to the '80s nostalgia vibe than just, well, nostalgia. Part of what keeps Back to the Future fresh and fascinating is the layering effect of period-specific signifiers: a movie about time travel that's also a time capsule. And frankly, given how whip-smart Zemeckis and Gale were in this period, I wouldn't doubt for a moment that it was actually being deliberately future-proofed... but I'm running ahead of the story a little bit. And that story, of course, is about the chronically tardy high-schooler Marty McFly (Michael J. Fox), an aspiring rock star - God help me, but in at least 20 lifetime viewings of the film, I've never been certain whether or not we're supposed to regard Marty as a great guitarist, or a jangling, awful one - whose best friend is the much older eccentric inventor Dr. Emmett Brown (Christopher Lloyd). Doc's latest invention is a time machine built into a DeLorean, which he demonstrates for Marty one night; a nasty run-in with Libyan terrorists results in Doc's death and Marty getting stranded in November, 1955, just a week and change less than thirty years into the past. Here, while working with Doc's younger self to fix the machine and get back to the future, Marty meets his mom (Lea Thompson) and dad (Crispin Glover), and manages to endanger his own existence by ruining the moment where they first met and fell in love. 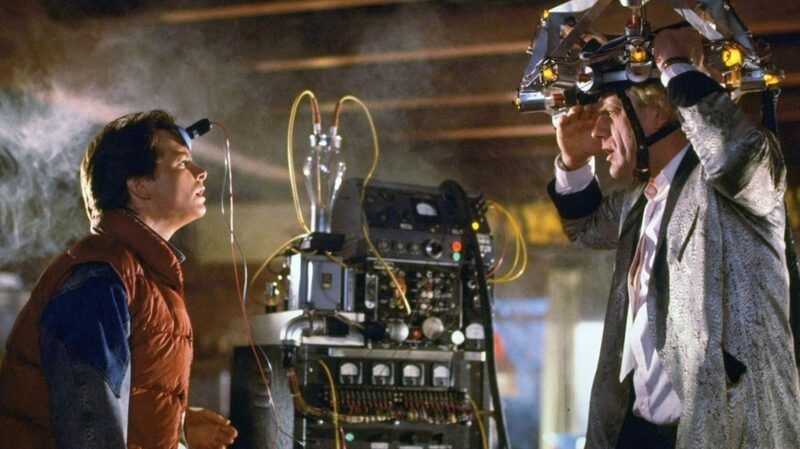 As with most of the director's films, Back to the Future is mostly about the successful execution of a narrative - while his mentor, Spielberg, has never been above the pursuit of an image or a technique or an emotional moment for its own sake, Zemeckis's best films have all been story-driven, even as they are at times perched right on the cutting edge of effects technology; though it is easy to lose sight of this in the degraded age of The Polar Express and Beowulf. Even as much as Who Framed Roger Rabbit or Death Becomes Her, for example, rely extensively on the best and brightest tech-nerd toys, Zemeckis's tendency was ever to use his directorial skills to keep the story moving, and to hit the right emotional notes at exactly the best moment. And with all that said, I think that Back to the Future boasts probably the tightest screenplay of any film in the filmmaker's body of work. It is a structural marvel: not one scene is wasted, not one line fails to have an exact, precise function (even if that function is solely to be funny). If something is described early on, and seems to make no sense otherwise, you can rest assured that it will be paid off in some specific way. The ballsiest example is the lightning storm that serves as the film's climax: it's introduced right at the start in an otherwise pointless scene, only to be made the thrust of the entire drama, giving the whole movie a ticking-clock format in addition to the other ticking clock, the photograph of Marty and his siblings that starts to fade away slowly as a result of his mucking about with his parents. My favorite example is the matter of Doc Brown's flux capacitor: he describes its creation in a reverie that initially just seems like the musings of an old man, and this leads him to set the exact date that Marty accidentally travels to, while also providing Marty with the necessary evidence to prove his identity to young Doc Brown and thus get the primary narrative started in earnest. Frankly, I don't think anyone would tell me I was flat-out wrong if I argued that Back to the Future is probably the most coherent time travel movie ever made; partially, it is true, because it does very little in the way of twisting, but mostly because Zemeckis and Gale pay exceedingly close attention to every detail, answering every niggling question that I, at least have ever thought up. On top of this remarkably solid framework, the other niceties of the screenplay are just candy, though very wonderful candy: the simple, but clearly-defined characters, the perfect comic dialogue (under-appreciated line: "The way I see it, if you're gonna build a time machine into a car, why not do it with some style?" is Doc's justification for the DeLorean, and Zemeckis's justification for his career-wide aesthetic). Back to my earlier point, though: Back to the Future is, explicitly and obviously, a study of the 1950s, both as tribute (its precise and particular re-creation of the colors and shapes of the architecture, the clothes, the design mentality; the privileged treatment of "Johnny B. Goode") and as satire (the self-serving hypocrisy with which the elder McFlys deliberately misremember their youths; the oblique indictment of Eisenhower-era racism). Zemeckis and Gale were both four years old at the time that their movie takes place, so for them it could only be an act of cultural anthropology to have made it; nor am I at all the first person to point out that Marty's journey within the film - back to the '50s, where he spends a good amount of time feeling hopelessly confused by how alien the culture of a scant 30 years ago is - mirrors the audience's journey - to a representation of the '50s presented with just enough stylisation that it feels entirely otherworldly. Less-observed (though nothing about a film as widely-loved as this can be properly described as "unobserved"), Back to the Future is, almost 30 years after the time of its creation, a representation of the '80s just as precise and particular, and as stylised and alien, as the representation of the '50s. The first thing we hear, almost, is Huey Lewis and the News, singing "The Power of Love", written just for the film. Now, if you can think of any relic of pop culture more quintessentially of the '80s than Huey Lewis and the News, you have a better memory than I; and this, plus those crazy '80s fashions, plus the intense high-concept '80s-ness of the whole edifice, makes Back to the Future a document of not one, but two bygone eras. I do not know if Zemeckis had this in mind; but as I said, he was a damn good filmmaker in his day, smarter than most other blockbuster auteurs and tremendously confident in the placement of every cut and camera angle. Is it too much to wonder if he found a clever way to over-emphasise the then-contemporary cultural artifacts, so that future generations would get even more out of the film than people did in 1985? Impossible to say, of course. But I am glad that the possibility exists, for it gives Back to the Future an extra shot of fun above and beyond it's great story, cast, and humor; indeed, though I hate to resort to a pun, it makes the film altogether timeless.